Each year thousands of runners, walkers, and volunteers support charitable organizations and promote health and fitness by participating in the Capital Region’s largest annual road race. 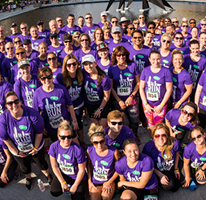 The CDPHP® Workforce Team Challenge is a 3.5-mile road race held every May in Albany. CDPHP will serve as the primary sponsor for the ninth consecutive year in 2018. The race is open to teams of employees from companies, organizations, and agencies that use the event as a platform to provide health and fitness opportunities in the workplace while promoting goodwill, charitable giving, and camaraderie among employees. The event is organized by and serves as the major fundraiser for the Hudson-Mohawk Road Runners Club (HMRRC), a 501(c)(3) organization. The funds raised help underwrite many HMRRC activities and services, including college scholarships, grants, running clinics, and the Just Run® program that encourages grade school children to run for exercise and fun. Every year, in conjunction with the race, HMRRC and CDPHP select one or more charities, each of which receives a donation from CDPHP, as well as direct contributions from race participants. To be considered for the Workforce Team Challenge Charity of Choice program, eligible nonprofit organizations must submit an application in January. Please check the race’s website and our Workforce Team Challenge page for additional information.